Summer is here and baseball is in full swing. The greatest game has the written rules of the umpires and the unwritten code of the players. 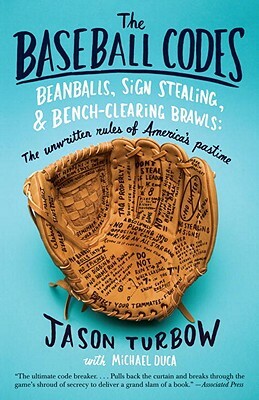 Turbow's book sheds light on the Code using hilarious anecdotes of players past and present; tracking the evolution of the Baseball's Code to the modern era. This book had me laughing at, and learning about, some of my favorite players and managers. An insider’s look at baseball’s unwritten rules, explained with examples from the game’s most fascinating characters and wildest historical moments. Everyone knows that baseball is a game of intricate regulations, but it turns out to be even more complicated than we realize. All aspects of baseball—hitting, pitching, and baserunning—are affected by the Code, a set of unwritten rules that governs the Major League game. Some of these rules are openly discussed (don’t steal a base with a big lead late in the game), while others are known only to a minority of players (don’t cross between the catcher and the pitcher on the way to the batter’s box). In The Baseball Codes, old-timers and all-time greats share their insights into the game’s most hallowed—and least known—traditions. For the learned and the casual baseball fan alike, the result is illuminating and thoroughly entertaining. At the heart of this book are incredible and often hilarious stories involving national heroes (like Mickey Mantle and Willie Mays) and notorious headhunters (like Bob Gibson and Don Drysdale) in a century-long series of confrontations over respect, honor, and the soul of the game. With The Baseball Codes, we see for the first time the game as it’s actually played, through the eyes of the players on the field. With rollicking stories from the past and new perspectives on baseball’s informal rulebook, The Baseball Codes is a must for every fan. Jason Turbow has written for The New York Times, The Wall Street Journal, SportsIllustrated.com, and Slam magazine. He is a regular contributor to Giants Magazine and Athletics, and for three years served as content director for “Giants Today,” a full-page supplement in the San Francisco Chronicle that was published in conjunction with every Giants home game. He lives in the San Francisco Bay Area with his wife and two children. Michael Duca was the first chairman of the board of Bill James’s Project Scoresheet, was a contributor to and editor of The Great American Baseball Stats Book, and has written for SportsTicker, “Giants Today” in the San Francisco Chronicle, and the Associated Press. He covers the San Jose Sharks for Examiner.com and works for the Office of the Commissioner as an official scorer and for MLB.com. He lives in the San Francisco Bay Area. "Delicious . . . Entertaining . . . The Baseball Codes reads like a lab report by a psychologist who has been observing hostile toddlers whack one another with plastic shovels in a sandbox."